February 2006 in Colorado (USA). 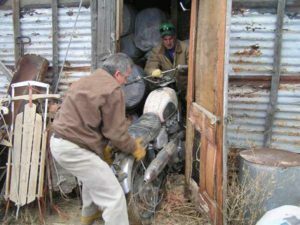 The bike was rescued from a dilapidated shed near Rifle Colorado. 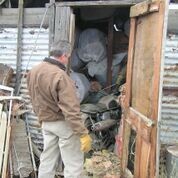 The guy in the brown coat is named Pat. 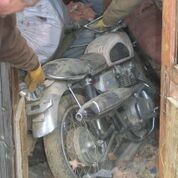 He is rescuing the bike in Feb. 2006. 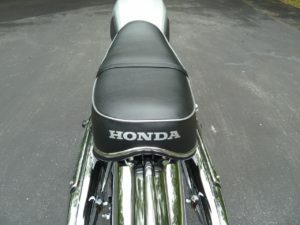 He is a friend of my brother and this is how I became owner of this bike. I bought it from Pat back in 2013. 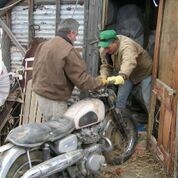 He had gathered a lot of parts for the bike, but was not mechanically inclined to do a complete restoration. 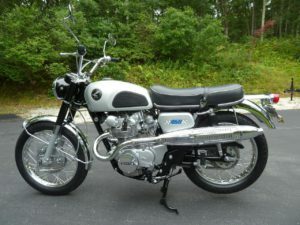 So, when I bought it, I received two huge boxes and two plastic totes filled with parts to almost do a complete restoration. The rest of the parts needed, I purchased. The first show I entered it in was; Misselwood Concours d’Elegance, won first in its class. 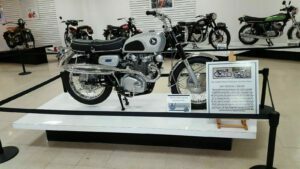 In 2014, it won Best of Show at the Vintage Japanese Motorcycle Club, National Rally in Pigeon Forge, TN. 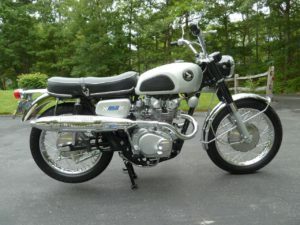 In 2015, it won Best of Show at the Vintage Japanese Motorcycle Club, Inaugural Rally in Gettysburg, PA. 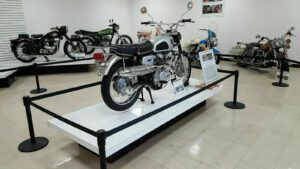 In 2017, it won Special Merit Award at the Barber Vintage Motorcycle Festival. 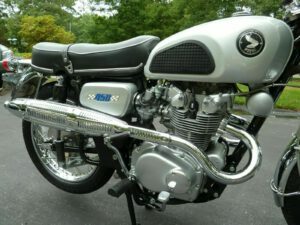 It has won two, First Place Stock Motorcycle trophies at the Cape Cod Classics Car Club; “Blast From the Past” All vehicle Show. 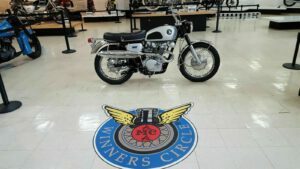 It has won the “Winners Circle” Award at the Antique Motorcycle Club of America, with three different years of judging and all scores were between 97 1/2 & 98 3/4 points out of 100. 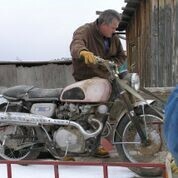 This bike, as of this writing, 2/23/18 is scheduled to load into the Motorcyclepedia Museum in Newburg, NY. 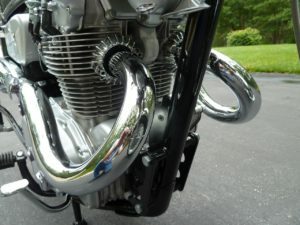 to be in the “Winners Circle Concours Exhibit” by March, sponsored by the AMCA & AMF.